We are celebrating another piece of awards success, as HND student Andrew Palfreyman won the Star Creative Student at the annual Marketing Society Star Awards in Edinburgh last night. This is the third consecutive win by our students in this particular award category. We had two shortlisted students, Andrew and fellow classmate Calum Mackinnon, who were competing against students from Edinburgh College of Art, Duncan of Jordanstone and Napier University. This year the client was John Lewis, and Andrew can now look forward to an internship, working in-house with the John Lewis creative team. Andrew (centre) receiving his award. 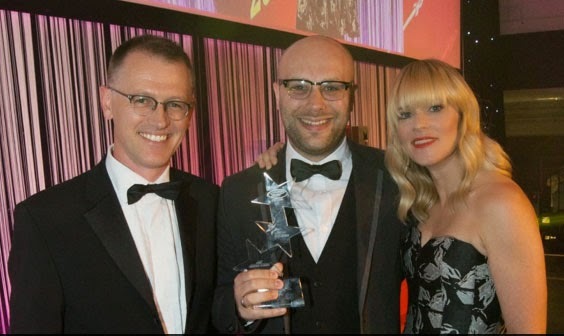 Celebrating its tenth anniversary, and presented by Edith Bowman, the Star Awards this year brought together the largest gathering of the marketing and advertising community outside of London - some 500 practitioners, clients and creatives. The full list of winners can be found here.